They give their all to provide child care, medivangelism, Bible Studies, church planting, film evangelism, and a tape lending library to the lovely people of the Philippines. Now, their partnership and vision have not only supplied the needs of people in the Pacific, but also on a global basis through their partnership with Brigada. Thank you! 4. MISSIONS PHOTOGRAPHERS: BE SEEN HERE! 7. WHERE DO MISSIONS PASTORS FIND OUT ABOUT OPPORTUNITIES? 2. TALKING BIBLES – BECAUSE THEY NEED TO HEAR — Now you can learn more about the efforts of Talking Bibles International and its partner, World Mission. Just visit http://www.talkingbibles.org and click on the link at the far right, ‘See the Talking Bible in Action – watch the video’. Regardless of where you are in the world, you’ll be able to watch this ministry at work, providing entire New Testaments inside the Talking Bibles. 3. MISSIONARIES GET FREE BLOG SITES… — at http://www.solidhope.com You can choose from several templates, privacy settings, and more. Check it out! June 6-10 Inside Islam, history, theology, Muhammad. June 13-17 Quran, Hadith, Sharia, Fundamentalism. June 20-24 Folk Islam, breaking strongholds. June 27-July 1, Culture, Church planting, Discipleship. 7. WHERE DO MISSIONS PASTORS FIND OUT ABOUT OPPORTUNITIES? — We know about sites that let missionaries know about open doors and unreached peoples. But where do missions pastors find news about open doors for *their* skills? If you have resources or know where these folks find out about open missions pastor opportunities, write Mark about it: MarkStephens adelphia net He’ll share the final report with the rest of us. Thanks Mark! 8. ONLINE CLASSROOM FOR STUDENTS OF ISLAM — To help propel missions education into the 21st century, Caleb Project recently debuted an on- line classroom designed to augment the Encountering the World of Islam (EWI) course. The http://www.encounteringislam.org on-line classroom features additional relevant readings, extensive course resources, and an electronic forum where students can wrestle with the ideas of the course. As the Muslim world continues to headline global news through peace efforts, wars, and natural disasters, Caleb Project’s Encountering the World of Islam course has grown. The course is designed to help Christians understand Islam and prepare to interact in loving and authentic ways with Muslims. In addition to providing resources and readings, the on-line classroom facilitates these purposes by providing a secure forum for student interaction. EWI students can post thoughts and questions about the course, learn from each other, and pursue community after the course. The EWI on-line classroom is a prototype for additional on-line education efforts. Plans are underway for on-line supplements for Perspectives on the World Christian Movement and Perspectives Exposure courses as well as Crossing Cultures, an eye-opening weekend workshop that will expose churches to the needs of ethnic communities in their neighborhoods. 13. AMAZING FRIENDS HELP BRIGADA STAY AFLOAT — Thanks to the amazing friends who are helping us get Brigada out the door and onto your screen! This past week, hats off to the folks at Bellevue Baptist Church in Arlington, TN, who pitched $50 into the mix for the cost of Brigada’s website, our Brigada-sponsored secretary, and more. Thanks Bellvue! Thanks, too, to the anonymous missionary in Africa who wishes to let other photographers (pro or amateur) know about the online Photomission.com community.” We appreciate you Photomission.com! And finally, thanks to Visual Impact Design for their gift of $25. Their newest project is SolidHope.com, where missionaries can find a free blogging site in a Christian blogging environment. Thanks Linda and all at Visual Impact! 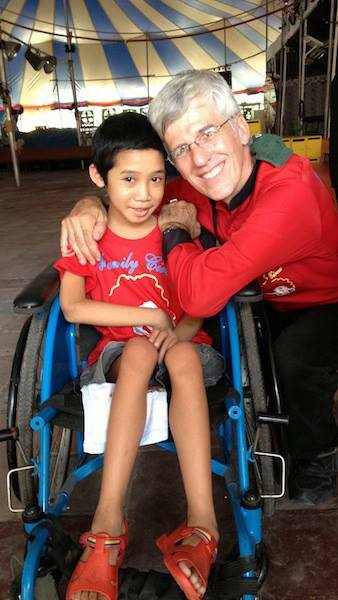 Would you like to chip in to help make Brigada’s ministry possible? If so, just click here. 14. THE BACK PAGE: THE ART OF FINISHING — What’s the difference between “finishing” and the alternative? In soccer, sometimes it’s inches. The striker unleashes a rocket of a shot that misses by just inches and the whole stadium erupts in a sorrowful sign of regret. In life, it’s the same. The farmer who never quite finishes cleaning out the barn. The engineer who, in the end, never quite delivers the architectural drawings he promised to do for his local church. They finally give up and hire a “real” architect. Well if you’re one of those statistics, take heart, for hope lies just around the corner. No matter how far behind you are, you can always wake up and make up your mind that today is a fresh start. Last week, ladies and gentlemen, [drum roll] I finally finished the next stage of my doctoral dissertation. I can’t even remember how many years I’ve been meaning to complete these chapters. I’d start and restart, but something always took precedence. Then came March 2005. “Click.” Something turned on inside of me. And now, the past is the past… and the future is the future! JESUS LOVES MUSLIMS IN WASHINGTON, D.C.
SPONSORS ENABLE US: “PROOF BEYOND A DOUBT” BOOK — Thanks to Mark Kelly of Kainos Press for sending $65 as a way of saying thanks to Brigada readers that ordered his book, Proof Beyond Reasonable Doubt! (And thanks to the 13 Brigada readers who purchased it!) As you know, gifts like these enable a Brigada-sponsored secretary, which, in turn, helps us get Brigada out the door and on your screen each week! Thanks Mark! PERSONNEL WANTED / MISSION OPPORTUNITIES WEB SWITCHBOARD — So let’s say we’ve got a school in Indonesia, which would normally like to enter an item like the one below (Item #15). Will GlobalMission.org serve to find workers and a suitable opportunity match? I would say so! See http://www.globalmission.org/ for full details. In the “Tools” section, click on “World Mission Directory” to look up a mission organization in what the site claims is “The world’s largest interactive online mission agency directory.” Also in “Tools,” click on “Mission Wanted” to let others know of your willingness to serve. Click on “Short Term Mission Projects” or “Long Term Service Opportunities” to discover options for service, either short- or long-term respectively. If you’re an organization that would like to *list* those, click on http://globalmission.org/tools/member/login.htm If you’re new to the page, you can open a new account, which will then give you all *kinds* of options for posting/editing opportunities. Although the folks there are referring to this as a kind of beta format, it seems to me that it’s already working great! So unless someone has a better approach, I’m suggesting we close out the almost- idle Brigada-opportunities email group in favor of this site. Let us know if you have feedback. TESL TRAINING IN TORONTO — MissionPrep-Toronto is offering a (TEFL- TESOL) May 10 -June 4, 2004) Teaching English as a Foreign (Second/Other) Language program that will equip you for an exciting ministry whether at home or overseas. This intensive 4-week training program will provide you with a wealth of practical and proven procedures, resources and models for teaching the full range of required components: listening, speaking, reading and writing; pronunciation, grammar, vocabulary, language use; etc. During weekly practicums you will observe successful programs within the rich multi- culturalism of Toronto as well as gain a minimum of 20 hours of teaching experience. For more information contact Priscilla missionprep globaltalk ca or call 905 -640-1621. CHRISTIAN MUSIC FOR MUSLIMS AND MUSLIM-BACKGROUND BELIEVERS — A Christian radio station for Muslims and Muslim-background believers is seeking indigenous Christian music (in any language) used by Muslim- background Christians around the world. He is willing to promote the albums and those who produce them but is unable to pay royalties for playing the music. If you have any such musical resources or know how to obtain them, please contact: afghanjohn earthlink net or mail them (with any usage restrictions) to: John Marion P.O. Box 34 Centreville, VA 20122 USA. English translations of the songs are welcome as are other content suggestions, interviewees knowledgeable about Islam, and studio equipment. PRINCIPAL/TEACHERS NEEDED AT INTERNATIONAL CHRISTIAN SCHOOL — Wesley Int’l School (WIS) in strategic (UPG loaded) East Java, Indonesia has a K-12 program. They’re located on a 3-year-old beautiful highland campus, with approx. 100 students from diverse countries & are currently pursuing WASC & ACSI accreditation. If you qualify as a principal, you would assist the current principal during 2004-2005 school year, with a view to serving as the principal beginning in the 2005-2006 school year. They’re also seeking secondary History, English teachers, an elementary & a ESL teacher. Check WIS out at: http://www.wesleyinterschool.org/ Contact Dave: DaudR aol com . So obviously, we can’t possibly list every single opportunity like this. So where would a school go for this kind of thing… if it wanted to find teachers for Indonesia, for instance? And where would teachers go to find a match for their skills? See item #1 above for one option. THE BACKPAGE: LIKE THE MOON, GOD IS THERE THROUGH THE NIGHT — Is God there, even while you’re sleeping? You bet He is. We know that in our *heads*, but my wife, Penny, recently learned it in her *heart*. A few weeks back, she went into the doctor with severe chest pains. The results of some follow-up tests led both the radiologist *and* Penny’s doctor to the same conclusion: Penny had contracted Emphysema! (By the way, she’s never smoked; nor have I. But though we thought this diagnosis was strange, the doctors seemed so sure, offering stats about non-smokers developing this fatal illness too, in as many as 5-10% of all cases.) During the next couple of weeks of further testing, Penny never wavered in her faith in the sovereignty of God… that He was in control. At the same time, there is no cure for Emphysema, and it normally ends in taking the life of its victim. Those were realities that she had to face, during those days. But she remembers waking one morning in particular, very early, while it was still dark. Immediately, she noticed up in the skylight window the giant full moon, shining brightly. To her, it was a kind of affirmation that God had been there all through the night. She took it as a symbol of his ever-present Lordship, beaming into her life. She paused to thank Him for the fact that even while we’re asleep, He’s already at work preparing our tomorrow. Perhaps you’ve already heard “the rest of the story.” A lung specialist concluded after additional tests that she does not have Emphysema. Instead, the chest x-rays were “overexposed!” We were overjoyed, and we counted it as answered prayer. However, this Friday (March 13), Penny sees a heart specialist about the original symptom: chest pains. We’d greatly appreciate your prayers, that God would grant the doctor wisdom and insight on her condition. Thank you for your concern and prayer during the past month! It means a lot… because it really is a jungle out there!